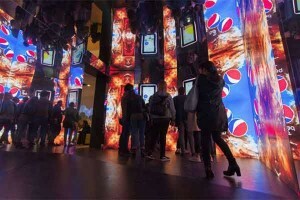 During the Fuorisalone, many locations often become a co-protagonist of the event featuring longer opening hours, and sometimes may even steal the show from the products or items presented or displayed. Former industrial spaces, historic buildings usually closed to the public, hidden courtyards, artisan workshops and fashion showrooms go beyond the concept of background and interact with their contents, becoming an installation within an installation. 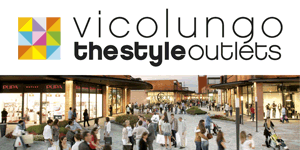 Moreover, during Milan Design Week many important brands located in the design districts introduce their new collections and host special events with live music and entertainment. Although the events are usually scattered throughout the city, the Fuorisalone recognises a series of main districts, usually distinguished by the endorsement of Milan’s Municipality. – Art gallery Galleria Pisacane offers its guests the chance to admire the preview of the permanent exhibition by Giancarlo Prandelli hosted at hall no. 5 of the art gallery. 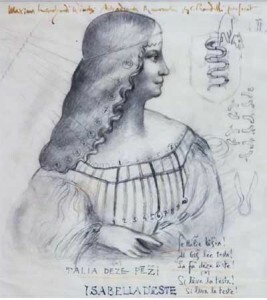 In his works the architect and artist analyses the mysteries behind the images and symbols used by Leonardo da Vinci and other important artists up to Dali’s works. Among Prandelli’s favourite images visitors can admire female portraits recalling the Renaissance style and the pictorial traits by Leonardo da Vinci, as well as knights and battles. 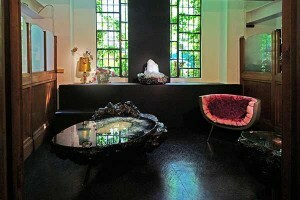 – Rinascente and Fuorisalone join forces for two special projects created by artist Vajiko Chachkhiani. The first, named Under the Midday Sun, is hosted within the window displays to the store overlooking Piazza Duomo featuring 8 prototypes of artworks depicting a man harvesting cotton, horse muscles and a tiger. The works are all incomplete and are surrounded by bushes, trees and wind to recall the impact of nature on men, animals and, more widely, living beings. The second project, Cotton Candy, consists in a movie telling the interior conflict of a woman who retraces her personal life and her fears during a circus show. 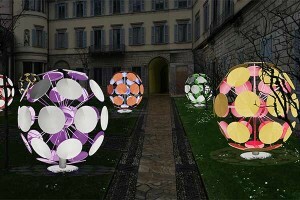 – Gallerie d’Italia, special partner to the 57th Salone del Mobile hosts the creative light installation “Dandelion” by Luca Trazzi enlivening the night of the Fuorisalone with colourful artworks located in the colonnade of Palazzo Anguissola and in the garden of Alessandro. – Top-quality coffee brand illy renews its partnership with the Design Week by introducing the Coffee Drawings project in the spaces of Triennale Design Museum. This new dynamic live performance by street artist Max Petrone (see picture) enables visitors to admire the artist at work while creating characters as well as short and adventurous stories on a blank paper only using coffee as a modern and innovative watercolour. 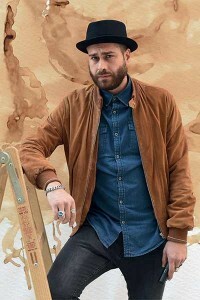 On 20 April, Max Petrone is also the special guest to illy Caffè Montenapoleone and is enthralling guests with a live performance at aperitivo time, before introducing a new collection of illy Art Collection coffee cups. – Discover the new collection of Home & Accessory by jewellery brand Tiffany & Co. at the highly central store located at no. 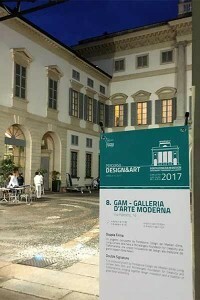 21 Piazza Duomo. 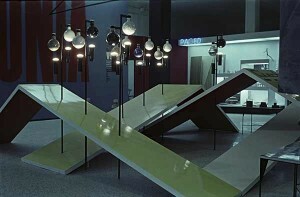 – Triennale Design Museum pays tribute to the Polish design of the ’50s and ’60s with the exhibition ‘Back to Front. Polish Exhibitions on Show’. The project has been organised to celebrate the 100th anniversary of the independence of Poland. The exhibition features black and white pictures, plastic projects and sketches, gathered and set on a project by architect Marcin Kwietowicz and graphic designer Marian Misiak. – Following a tradition established since 2012, Louis Vuitton becomes the protagonist of the spaces of Palazzo Bocconi with the installation Objets Nomades. The 2018 edition of Fuorisalone sees the introduction of two new creations, Diamond Mirror by Marcel Wanders and Ribbon Dance, created by Andre Fu. Moreover, the spaces also host the first collection of small innovative objects for the home, created by designers such as Humberto and Fernando Campana, Atelier Oï, Patricia Urquiola and Marcel Wanders. Open for free daily 10am-8pm. 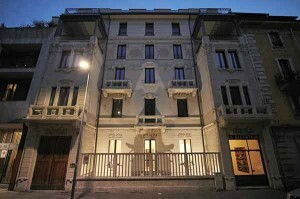 – From 17 to 22 April, the Milanese 5-star hotel ME Milan Il Duca becomes an ideal continuum to the spaces of Galleria Rossana Orlandi – located at no. 14 via Bandello – serving as the backdrop to some of the creations by emerging talents selected by the Italian designer Rossana Orlandi to reflect the soul of the hotel. The lobby, as well as the garden and hall to the hotel, turn into a promenade into the world of design, filling the space with creativity and engaging guests. – Piazza Cesare Beccaria is the new go-to destination for innovative housing solutions. Massimiliano Locatelli | CLS Architetti, in collaboration with Italcementi Heidelberg Cement Group, Arup and Cybe have introduced the first house fully made with the use of a 3D printer to offer insightful highlights on sustainable architecture. – On the occasion of the Design Week, design and furniture store Arredando features a special collection of bags, accessories and objects for the home, such as tableware, decorative cushions and carpets by brand LoomLoomMilano dedicated to comics character Valentina by artist Carlo Crepax. The collection features trendy and creative designs and is available exclusively at Arredando during the days of the Fuorisalone. 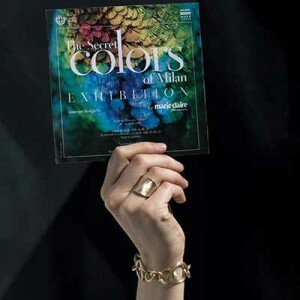 – Fine jewellery brand Marco Bicego is the protagonist of the installation ‘The Secret Colour of Milan’ in the spaces of Galleria Manzoni in Milan. Eight rooms and eight window displays become the ideal stage to a still life collection. The different colours from which the installation takes its name serve as the backdrop to the collections to the brand, inspired the colours and shapes of nature, as well as by the natural stones they nestle. 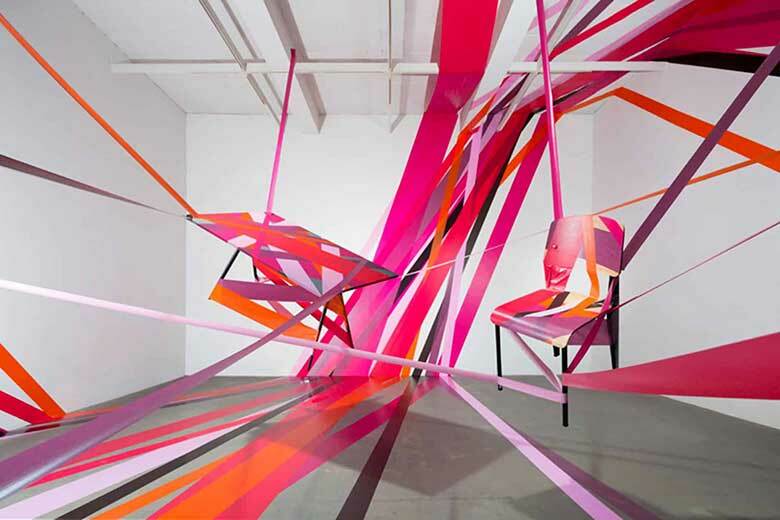 The design to the installation has been curated by Studio Marco Piva for Marie Claire Maison. Particularly noteworthy among those exhibitors dedicated to studying our perception of technological processes and their impact on our daily lives, is American design studio UM Project whose ‘Patch’ project envisages the future of smart houses and cities. They explain this saying: “like the furniture in our homes, networks are becoming more familiar and friendly – a sort of silent partner, a welcome embrace, a reassuring blanket”. A type of goodnatured big brother takes centre stage in the exhibition project developed by the former alumni of the Design Academy, with a new interactive installation that traces and follows the viewer by tracking his eye movements. Ventura Future also features two projects by Patricia Urquiola, plus others by Mingone, Federica Biasi, Denis Guidone, Mae Engelgeer and Valerio Sommella. Following the overwhelming success of last year’s experiment, the second edition of Ventura Centrale is held under the industrial vaults of the old warehouses located under the rail tracks of the Central Station, in via Ferrante Aporti. Here, visitors are treated to an eclectic mixture of contemporary design by emerging designers and well-established firms including Nitto, Asahi Glass and Eileen Fisher with DesignWork, curated by Li Edelkoort, and ‘Paradigma’, an exhibition/installation by Fabrica. To celebrate its 25th anniversary, the American magazine Surface teams up with celebrated architect David Rockwell to create ‘The Diner’, a contemporary reinterpretation of typical American restaurants which, in addition to serving food, also hosts events, conferences and parties until late at night. This year, the spotlight is trained on the spaces of the old Meazza hardware store – an iconic symbol of post-war Milan, which closed down two years ago. The space hosts various projects, including a tribute to the work of Nanda Vigo. The items displayed include her 2005 ‘Goral’ totems, fitted with neon light signals representing the elementary signs of the cosmogenic alphabet and a wall display of her luminous tree sculptures titled ‘Light Trees’. In vicolo Bagnera, renowned for being Milan’s narrowest, most mysterious street, Portuguese artist Xena will pay tribute to Italy’s rich cultural heritage, and stage a show of light and shadows, narrative and reality, inspired by the work of Caravaggio. 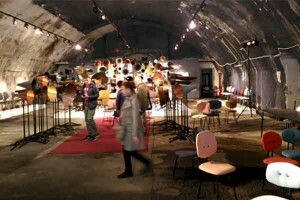 In the early 2000s, you said Fuorisalone and you meant SuperStudio and Tortona. Today this district is the showcase of the biggest names from the design industry. In 2018, the Tortona Design District has played its trump cards: Base Milano, a new multifunctional venue, located at the former industrial Ansaldo complex, hosts exhibitions and projects. Still, if you visit Tortona you can’t skip the SuperStudio, featuring a specific focus on ‘quality and design’. Aptly named ‘Only the Best’, the programme features the personal exhibition by design studio Nendo, the project Kengo Kuma based on technology and sustainability by Dassault Systèmes, the exhibition Smart City and the Superloft project, displaying the ideal house/loft for the future. The Brera Design Apartment is an exhibition space located in via Palermo 1 that has been designed to host events, exhibitions, shootings, presentations and business dinners. This year, these authentic design residences, equipped with all the essential mod cons, host an exhibition organized by Raffaella Guidobono. This exhibition, featuring creations in soapstone, blown glass, Limoges porcelain, brass and solid, hand-cut wood, explores light design and superior craftsmanship. At the same time, 12 designers have been invited to create an innovative item for the launch of ‘Souvenir Milan’, a collection of mementoes symbolizing Milan, including a Last Supper-themed brooch, sequined porcelain fridge magnets and a saffron container in honour of Milan’s traditional yellow rice. 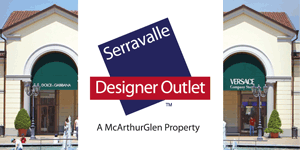 All of the items mentioned can be purchased on-site. As is customary, the Lago apartment (via Brera 30), another renowned cultural and residential experiment, hosts events and meetings. To mark the occasion, it is redecorated with 40 different elements including patterns, furnishings and upholstery created by the same number of young Italian talents. Porta Venezia in Design combines thee fundamental aspects of the area: the most contemporary side of design, an itinerary in discovery of the Liberty architectures of Porta Venezia area and a gourmet journey through the world of food and wine. This area is particularly interesting for its Liberty itineraries organised in collaboration with FAI-Fondo Ambiente Italiano, free upon reservation and held on Saturday 21 (at 11 am and at 5pm) and Sunday 22 April (at 11am). During the Fuorisalone showroom and stores introduce the latest creations in design with a particular focus on Liberty style and the food&wine field. Among the latest additions visitors can find Spazio Folgosa hosting the two temporary projects, la Giacca Volante by fashion designer Andrea Folgosa and the graphic works Chiara Passigli, Creazioni d’Interni (in via Rosolino Pilo, 16) introducing a brand-new collection of custom-made furniture and the new showroom 1P / Primo Piano where guests can experience the latest innovations in multimedia immersive technologies for museums as well as for the retail field. Moreover tapestry and wall fabrics Jannelli&Volpi introduces its latest collections of wallcovering named Escher®, Marimekko5®, Design Lux, Altagamma Rainbow, JV Kerala – Armani Casa Exclusive Wallcoverings Collection®- Refined Structures 2 and JV Kerala. 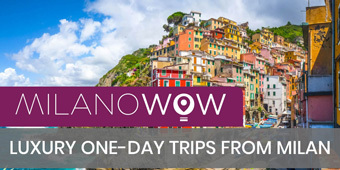 Journalist based in Northern Italy, passionate traveller, photography lover and unstoppable curious of the world. From her early years cars and motorbikes strike a chord in her heart, as well as the entire world of fashion. Giulia works for Where Italia to share her passions and to promote the most unmissable events and lifestyle experiences. To make Where readers' trips a one-of-a-kind discovery.